Florida’s Gulf Coast is known for its white beaches, lush plant and aquatic life, and unique wildlife. But this verdant paradise is threatened by the rise of red tides: harmful algae blooms that harm Florida’s economy, the health of coastal residents, and a very fragile ecosystem. What can the legal system do to protect Florida’s coast? I. An algae bloom in the Gulf of Mexico is wreaking havoc on Florida’s economy and environment. An effective state and local response can help provide a solution. Florida’s southwest coast, once a haven to wildlife and tourists alike, is experiencing one of the worst red tides in recent memory. Red tides, harmful algae blooms (“HABs”) which often have a red hue and affect both inland and coastal waterways, are common occurrences in Florida, but they have increased in both intensity and frequency in recent years. This blog post will discuss the problems that red tides pose to communities in Florida and the legal structures that could help provide a solution to this growing problem. II. Red tides are a relatively common occurrence in Florida historically, and they have strong impacts on the state’s economy and environment. In Florida, red tides typically involve one of the most harmful species of HABs, the karenia brevis. Karenia brevis produces “neurotoxins that cause damage to nerve cells or tissues [and] kill large numbers of fish, birds, and other marine mammals.” Shellfish that consume Karenia brevis become poisonous to human consumers, and people can inhale toxins released into the air by seaspray, which cause symptoms including “itchy and watery eyes, wheezing, shortness of breath, coughing, and chest tightness.” Red tides are a frequent occurrence in Florida and “appear off the state’s coast almost every year.” Red tides have been “documented…along Florida’s Gulf Coast since the 1840s.” The ongoing red tide has been present for over 10 months, the longest duration of a red tide since 2006. Red tides in Florida have had strong social and cultural effects on local communities throughout the state. HABs, in general, can lead to “loss of recreational and commercial opportunities, disruption of…cultural practices, conflict among resource users, loss of community identity tied to using coastal resources, and social stress in affected families and communities.” In Florida, red tides can mean additional stress for communities that depend on the coast both for leisure and work, and individuals have fewer opportunities to meet with other people that share their interests, which builds community bonds. For example, recreational fishers lose the chance to fish together when beaches are closed. Red tides also have deep impacts on the economies of localities across Florida. The presence of red tides can disrupt the ability of individuals to go to work and causes an increase in the use of medical resources, because “respiratory and gastrointestinal illnesses increase during red tides” and can cause up to a 54% increase in hospital admissions for coastal residents. Red tides have the unfortunate effect of depressing tourism, because beaches become “strewn…with the stinking carcasses of fish, eels, porpoises, turtles, [and] manatees.” Nationwide, HABs cost “at least $82 million per year including lost income for fisheries, lost recreational opportunities, decreased business in tourism industries, public health costs of illness, and expenses for monitoring and management.” While it is difficult to estimate exactly how much of an impact red tides have on Florida’s economy every year, red tides have a significant impact on the livelihoods of individuals and communities across the state. Finally, red tides can negatively impact the wildlife and environment across very large areas of the state. In the current red tide, “almost 300 sea turtles have been found dead since January ” in just four Florida counties south of Tampa, and a biologist at the Florida Fish and Wildlife Conservation Commission noted that “he believed that a majority of the turtle deaths were attributable to the red tide.” Additionally, the “number of manatee deaths…this year [as of August had] already exceeded the total for all of 2017” with 554 deaths in 2018 compared to 538 total in 2017. The pattern of rising death rates has been observed for other threatened species across the state, and while it is difficult to attribute the new deaths entirely to the presence of red tide, the two correlate. III. Scientific research is split on the causes of red tides, but both natural and man-made factors can contribute to the development of red tides. There are several natural factors that contribute to the growth of red tides. The Florida Department of Health reports that red tides develop “when biology (the organisms), chemistry (natural or man-made nutrients for growth), and physics (concentrating and transport mechanisms) interact to produce the algal bloom.” Without all three factors present, a red tide will not develop. In addition, scientists have discovered that “oceanic and estuarine circulation and river flow greatly influence the…combined physical (e.g., currents, upwellings, etc.) – the chemical (e.g., salinity, nutrients, etc.) factors of the systems.” If the factors that contribute to red tide have the ability to travel and interact with each other, the change of a red tide developing rise much higher. While climate change’s effects on red tides and the rising of sea temperatures is still uncertain, it appears that “the incidences of red tides…have increased since the 1950s and 1960s [and] climate change could be a factor [because] warmer waters…are congenial to growth.” As the effects of climate change become more pronounced in the decades to come, researchers will have more data to see if there is a connection between ride tides and rising water temperatures. Politically, it appears that governments, at all levels, have been unable to respond effectively to the problem. Some political groups in Florida blame Governor Rick Scott “for weakening the state’s water quality requirements and monitoring [but] Scott blames Sen. Bill Nelson…for not doing something before now to stop” red tides. At the very least, it looks like political actors in both parties have been unable or unwilling to cooperate across different levels of government or across the aisle to come up with a solution. The political gridlock does not appear to be coming to an end any time soon, but there are several potential solutions to the problem of red tide. IV. There are several potential legal responses to red tide in Florida. State and local governments can and should take an active role in fighting the effects of red tide. Lawmakers can take action to limit the growth of red tides by encouraging scientific breakthroughs, improving coordination among governments, researchers, and businesses, and tightening fertilizer ordinances The responsibility for addressing the problems caused by red tides has fallen on Florida’s state and local governments. The legal system could provide a solution to the red tide problem by supporting scientific solutions, encouraging coordination of mitigation activity across governments, and enacting stricter fertilizer ordinances. Finding scientific responses to red tides are complex because scientists are uncertain of “what effects [the methods] could have on the ecosystem,” and because the geographic extent of the red tides covers “hundreds to thousands of square kilometers of shelf waters and extending down to 50 [meters].” The state and local governments could support the effort that scientists are making by providing scientists researching the problem with additional funding, expertise, and data. In general, coordination and information-sharing on red tides is improving among governments, private parties, and scientists, but there is still much work to be done. While “some of the [current] coordination is formal, most of it consists of informal regional partnerships with common interests.” Florida should formalize the coordination system among localities across the state. If each locality was able to look at the data available from other areas in the state and responses were coordinated across large regions, there would likely be an overall more effective response. Localities and the state as a whole only stand to gain from deeper coordination, but only the state legislature and governor can create the legal structures that are necessary. It was possible for Florida to respond to the threat of hurricanes by developing state-wide emergency response plans, and it should be no different for red tides and other environmental problems. Finally, the legal system in Florida can respond to the threat of red tides by developing stricter fertilizer ordinances that would deprive the ecosystem of the man-made nutrients that contribute to the growth of red tides. While simply depriving waterways of man-made nutrients will not be enough to stop all red tides, researchers argue that it could help slow down the growth of red tide. However, current restrictions on fertilizers “differ as to type and extent” which limits their effectiveness and make it difficult for individuals and businesses to comply with the laws. By creating a uniform standard that applied throughout the state, lawmakers could “lower the costs of compliance” while ensuring that firms in the fertilizer industry are not “geographically disadvantaged.” While some argue that having a single, uniform standard would lead to an overall weaker set of ordinances, it is likely that having at least some standard statewide that all organizations comply with would have an impact on red tides. V. Conclusion: The legal system can rise to meet the red tide threat. Red tides are a problem that threatens the cultural life, economy, and environment of Florida. While red tides have impacted Florida’s coastlines since at least the mid-1800s, recent red tides have grown in strength, duration, and frequency, and as the climate changes, it is likely that red tides will change as well. 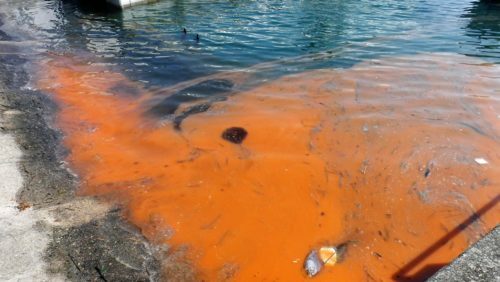 Researchers have found that while both natural or man-made factors can create red tides, the legal system can respond to this growing problem. If the legal system supports the work of scientists, improves coordination amongst stakeholders, and creates stricter fertilizer ordinances, it is possible that communities throughout the state can respond in an effective way to red tides. Scientists and lawmakers certainly do not have all the answers to the problem of red tides, but by taking firm action today, Florida can become a more environmentally resilient state that leads the way as other states face their own environmental problems. The Red Tide Control & Mitigation Program, Report to Stakeholders 4 (2010). Tryggvi Adalbjornsson and Melissa Gomez, A Toxic Tide is Killing Florida Wildlife, N.Y. Times, July 30, 2018, https://www.nytimes.com/2018/07/30/climate/florida-red-tide-algae.html. Florida Dept. of Health, Frequently Asked Questions: Red Tide 1 (2014). Lorraine Backer, Impacts of Florida red tides on coastal communities, 8 Harmful Algae 618, 620-21 (2009). Michael Nedelman, Florida’s Toxic Algae Problem: ‘Red tide’ and ‘green slime’, CNN (Aug. 18, 2018), https://www.cnn.com/2018/08/16/health/toxic-algae-bloom-health/index.html. Joel Achenbach, Kate Furby, and Alex Horton, Florida declares a state of emergency as red tide kills animals and disrupts tourism, The Wash. Post, Aug. 14, 2018, https://www.washingtonpost.com/news/speaking-of-science/wp/2018/08/14/red-tide-algaes-deadly-trail-of-marine-animals-has-triggered-a-state-of-emergency-in-florida/?noredirect=on. E.B. Jewett, et al., Interagency Working Group on Harmful Algal Blooms, Hypoxia, and Human Health of the Joint Subcommittee on Ocean Science and Technology, Harmful Algal Bloom Management and Response: Assessment and Plan 1 (2008). Craig Pittman, More manatees have died in Florida so far this year than in all of 2017. Here’s why, Tampa Bay Times, Aug. 21, 2018, https://www.tampabay.com/news/environment/wildlife/Red-Tide-s-continuing-toll-The-554-dead-manatees-in-2018-already-surpasses-last-year-s-total-_171056483. Florida Dept. of Health, supra note 6, at 1. Kevin Sellner, et al., Harmful Algal Blooms: Causes, Impacts and Detection, 30 J. of Industrial Microbiology & Biotechnology 383, 386 (2003). Karen Steidinger, Historical perspective on Karenia brevis red tide research in the Gulf of Mexico, 8 Harmful Algae 549, 556 (2009). Jewett, supra note 11, at 3. Barbara Kirkpatrick, et al., Human responses to Florida red tides: Policy awareness and adherence to local fertilizer ordinances, 493 Science of the Total Environment 898, 898-909. Kirkpatrick, supra note 24, at 903.